Just to show that I am an equal opportunity critic (proponents of mainstream science as well as pseudoscientists) I am going to give a wag of the finger to the Smithsonian Magazine. 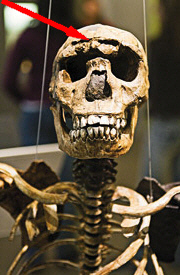 The March 2010 issue has a feature article on human evolution that celebrates the opening of the Smithsonian Institutes new Hall of Human Origins titled “Our Earliest Ancestors” (Here is an online version) by Ann Gibbons. The problem, however, is not with the article per se but rather with some of the illustrations given in a timeline titled “Unearthing Our Roots” (Gibbons 2010, pp.36-37) which is found within the article. The timeline gives the readers a brief outline of the history of paleoanthropology from the Neanderthal (Homo neanderthalensis) fossils discovered in German in 1856, to the more recent finds like those of Sahelanthropus tchadensis found at Chad in 2001. The first refers, as I said, to the 1856 Neanderthal find and includes what is supposed to be a picture of a Neanderthal. 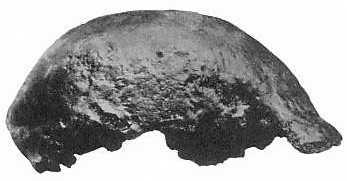 The second is the 1891 discovery of “Java Man” (Homo erectus) with a picture of a fairly compete skull of a H. erectus. I’ll start with the second one first as it is slightly less of a blunder and indeed some might say I am being a little pedantic for pointing it out. While the text refers to Eugene Dubois‘ 1891 discovery of “Java Man” in Indonesia, the picture instead seems (judging by the open space in the side of the skull and the lonely right canine), to be a later H. erectus find called Sangrian 17. 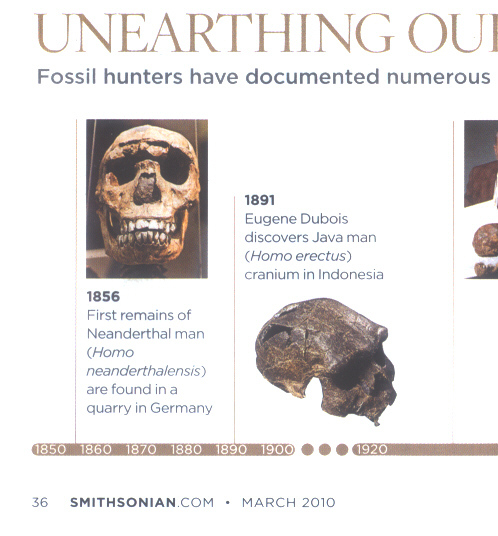 Now here for comparison is a larger version of the picture printed in the magazine taken from the Smithsonian Magazines web version of the timeline (which is also inaccurately labeled as a Neanderthal). I’ve dropped in a red arrow pointing toward damage in the brow ridge and just below that the gap in the skull between the eyes, both identical to those seen in the AMNH cast of KNM-WT 15000 pictured above. I’m afraid someone at the Smithsonian Magazine needs to double check their work. This entry was posted in Comparative anatomy, History of Science, Paleoanthropology, Paleontology, Science, Science in the media, Systematics and tagged Eugene Dubois, Homo erectus, Homo ergaster, Homo neanderthalensis, Java Man, KNM-WT 15000, Neanderthals, Smithsonian Institute, Smithsonian Magazine, Turkana Boy. Bookmark the permalink. while we’re correcting…the Time article was published in 2019? Gibbons – what an appropriate name. Ha, Ha!! Yeah, I thought of that as well George. I almost made the joke but figured I would be nice. 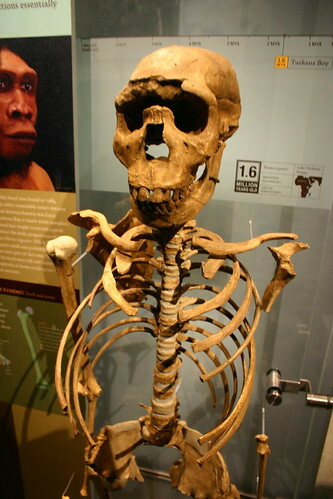 Troy, thanks for your post about Ann Gibbons’ story on Hominid Evolution in Smithsonian. I’m an editor there who worked on the story. We decided whenever possible to use images that would be easy for readers to understand. The timeline, especially, had to show many small images of specimens that some of our readers are reluctant to consider their ancestors. For Java Man, we did go with the more complete skull from the same place and species. We’re trying to figure out what happened with the Neanderthal image–the source we used labeled it as Neanderthal, but your comparison with Turkana Boy makes a good case. We’ll let you know if we figure out where the photo was taken and which specimen it shows. Their “H. erectus” image is certainly Turkana Boy, which I understand is “H. ergaster.” But you can’t blame the museum for not showing Dubois’ original Java Man or H. erectus because the fossils disappeared about World War II–although there are casts. In any case, the specimens should be correctly labelled without any false claims. Actually I think you’ll find that you are confusing “Java Man“, the original Homo erectus find (formerly “Pithacanthropus erectus”), with “Peking Man“, a later H. erectus find (formerly Sinanthropus pekinensis). And while it is true, as you say, that the original Peking Man fossils disappeared during WW2, there were subsequent finds of H. erectus at the same locality in China. As I recall it is said that one of the fossil fragments found after the war even fits together with one of the surviving casts pieces (which are beautiful btw).